Work two times faster with an efficient, end-to-end solution that lets you print AND cut at the same time vs a print OR cut solvent workflow. 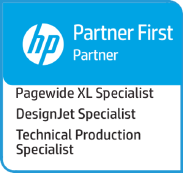 Save up to 50% of the time with a complete HP solution that is designed to work as one. Print more applications, full bleed stickers don’t shrink or curl; reach indoor spaces solvent can’t. Enjoy accurate high-speed cutting and cut throughs; LAN connectivity and HP media basket add convenience. 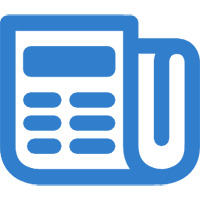 Optimised workflow management from a single point – includes unique software with barcode integration. 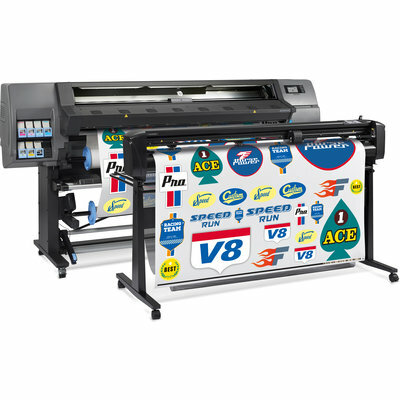 Print AND cut at the same time – versus print OR cut with solvent – with this reliable, dual-device solution. Avoid solvent wait time – prints come out dry, cut/laminate right away with no degas time, and deliver same day. Avoid lamination for short-term applications – scratch resistance is comparable to hard-solvent inks. Print and cut in 5 simple steps – add cut lines from the RIP, predefined cutting presets, easy user interface. Efficient job recognition and reliable, error-free cutting – Optical Positioning System (OPOS) and HP Barcode. Avoid the complexity of other dual-devices – this complete HP solution is designed to work as one.